For many years groups of GLBTI families have spent the weekend or just a day at Daylesford for ChillOut. 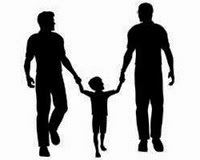 Once again a group of gay dads are heading up on the weekend of ChillOut and it would be awesome if we can get as many other Rainbow Families to ChillOut as possible. The weekend is fun and very rainbow family friendly. If you come up for a day, then make it the Carnival Day on Sunday. If you come up for the weekend, why not rent a house or caravan - either just your family or split the costs with another. Each year we go with a group of other gay dads and kids. Each year we meet lots of new Rainbow Families and their kids (and lots who are keen to become parents). Organising big weekend events are always challenging but if you are thinking of a weekend away with Rainbow Families, why not make it ChillOut 2015. The Rainbow Families have heaps of opportunities to connect at the parade and carnival, as well as other events over the weekend. Closer to the date I will try and organise a contact list of those families going if people are interested. There are at quite a few Rainbow Families already going - hope to see you there.